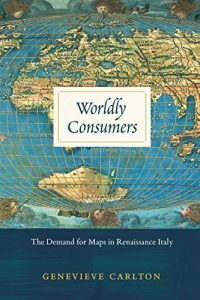 Worldly Consumers: The Demand for Maps in Renaissance Italy. Chicago: University of Chicago Press, 2015, 237 p. $45.00. This book elucidates the early market for printed maps in Florence and Italy and how geographic knowledge was spread. It focuses particularly on records of prominent early producers of printed maps. The study adds to the work of David Woodward (Woodward, David. Five Centuries of Map Printing, University of Chicago Press, 1975; Woodward, David. Maps as Prints in the Italian Renaissance: Makers, Distributors, and Consumers. British Library, 1996; and Woodward, David. The History of Cartography, Volume 3: Cartography in the European Renaissance. University of Chicago Press, 2007). Worldly Consumers reconstructs the Renaissance printed map market by examining government and map shop inventories in Florence (1464-1531) and Venice (1497-1631). Maps in the inventories were identified and categorized as world, regional, and city maps, navigational charts, and landscape maps. These types would have been familiar to Italian consumers in the 16th century. The inventories from the map shop of Florentine mapmaker Francesco Rosselli provided a particularly rich source of data on the printed map trade. Another source was the thousands of household inventories in Italian city-states, which could be investigated for the occurrence of maps. Prices were identified from the inventories. Printed maps became cheaper than art works in the 16th century, and thus more affordable, in contrast to the situation in the 15th century. Carlton notes that even the most expensive map in Rosselli’s inventory was much cheaper than manuscript maps of the time. Even consumers with less means could afford some printed maps. Maps became more of a commodity, and mapmakers became less dependent on noble patronage. Landscape maps and world maps were the most popular to Venetians, even though high numbers of regional, city, and navigational maps were produced. The navigational charts may have just interested mariners who used them on ships, not in households. Regional maps were often bound into atlases and many were found in Venetian homes. Foreign maps were collected and displayed if they showed areas that were tied to Venice through politics or trade. Much of the book focuses on the value of printed maps to their consumers. Data were obtained from the inventories, display manuals, epigrams, printed catalogues, and textual and visual elements on the maps themselves. Maps were valued beyond pure aesthetics as a source of geographic knowledge during a time of great discovery. Italian Renaissance consumers wanted to learn more about the world and show their sophistication, increase their cultural capital. Buyers were not always interested in accuracy, and a number of maps were just reproductions of previous editions without updates of new information. Some mapmakers added notes and some decorative information to make the maps more attractive for display. Venetians were particularly interested in displaying their maps. Their houses and palaces had public receiving rooms where maps could be placed alongside flattering portraits of their families and images of religious figures. Advice manuals helped customers decide on the maps and their arrangement. Carleton concludes “If we choose to focus only on the political power of maps we risk missing their immense cultural power – a map in the right hands, was an avenue into the cosmopolitan, sophisticated, and global world of the sixteenth century.” Perhaps the same is true for some early map collectors today. Genevieve Carlton is a good writer, and the work flows well. There are repetitive sections in the later chapters, though. This is a scholarly work. The text is followed by 44 pages of notes, a list of the 32 map sources, an extensive bibliography, and a detailed index. The list of map sources gives no indication of where to view the maps. Several early maps are mentioned in the text, but only 19 are shown in the figures. Most of the reproductions cover one-quarter to one-third of the page. All are in black and white. This makes some sense, because most of the printed maps did not have color unless the map was hand-colored later. The copy of Jacopo de’Barbari’s “Venetie” from 1500 (fig. 7) is too dark to read. Perhaps the idea was that readers would search the Web for bigger and better copies. Readers might want to consult an atlas. World Consumers would interest libraries that cover the history of cartography or, for that matter, Renaissance history. Libraries that collect reproductions and descriptions of early maps should search elsewhere. This is not a book for the average map collection. Much has been written about the geographic discoveries by explorers in the 15th and 16th centuries. Carlton’s study reveals a small piece of the general public’s reception of these discoveries. The strong interest in world maps in Venice demonstrates an interest in current geographical knowledge. In a way, the development of printed maps had a strong effect on Renaissance geographical knowledge as the development of Google Earth, GIS, and online mapping has had on current geographical knowledge. Colored manuscript maps may have been striking, but perhaps the advent of printed maps may have had the greater influence in the long run.